When will Rhune be available for sale? This is a question I’ve been hearing a lot lately. I’m sure a lot of it has to do with the beta that should be occurring soon now. Let me take you three three possible scenarios for this book. Of course #1 is my, well, #1 choice. I’ve really enjoyed having Orbit as my partner and I think they would do an excellent job with The First Empire. But there is no guarantee they will want to pick up the title (they passed on Hollow World). And if they DO make me an offer, there is no guarantee the two of us will agree on what a fair price will be. My Riyria books have sold well (and continue to be strong even as we approach their third anniversary). But the industry is in turmoil and so there is a great deal to consider. For instance, my current sales are less than they have been because of the steps taken by Amazon during Hachette’s dispute with Amazon. Also, advances are decreasing (I was actually offered what I considered to be an insulting offer for The Riyria Chronicles when I first submitted them – luckily they came back with a higher offer and we did keep the books with them). Plus there are some contractual considerations that Orbit and I may not see eye-to-eye on. Long story short…I have no idea if the project will be with them. But let’s assume they do produce it…If history is any indication, it will probably be released about a year after I submit to them which would put it at January 2016 or thereabouts. So if Orbit and I can’t seal a deal, then my agent will “shop it around” to other publishers. There are already several who have expressed an interest. But she can’t even start that process until Orbit and I complete our talks. That is what is called an “option” and it basically means Orbit has 45 days after I submit to determine if they are interested. So the real question is, “When will the book go to Orbit?” Well, let’s discuss a few things on that front. I have to finish book #4 of the series (which I’m shooting for mid-November). Then I’ll need to edit and get the book to Robin, which will probably take until mid-December. While I’m working on #1, the first wave of Beta readers will be giving their feedback. If I submit the book to Orbit in early January, they’ll have until mid-February to strike a deal. So, the earliest #2 can start is mid-February, and I have no idea how long that process will take. I’m working with a new agent for this project, and I’m not sure what her process will be (it’s meaningless to have those conversations if we never get there. But let’s assume a few months for that – so now we are in April or May). Depending on what publisher has it…and what their release schedule looks like it could be anywhere from 1 – 2 years. Let’s assume 18 months that puts it at October 2016. Self-publishing is still a viable option for me. In fact, Hollow World has earned very well for me. In fact, I made more than double the five-figure advance another publisher offered. And from an income perspective it has out-earned The Crown Tower and the Rose and the Thorn. So let’s say that come May I’ve decided that all the publishers are: (a) not interested or (b) interested but not offering me what I think the books are worth or (c) offering me a good advance, but contract terms I can’t abide. That will put me at option #3. In this scenario, the book will probably come out the fastest. Here is what I would do. I should be able to have the cover design and professional editing done while the Kickstarter is running so the book will be ready by say July 1, 2015 – and anyone who backs the Kickstarter can have their copies. As an incentive for the Kickstarter contributors, I’ll give them a few months of “exclusivity” where the book isn’t available to the rest of the world. So I’ll probably put it for sale to the general public in November 2015. I know that’s not very precise, but it’s the best I can do for now. As always, I’ll keep you updated as more information becomes available. Everyone loves limited editions…and this is about as limited as it gets. Robin had the great idea of printing up a handful (10 copies) of the version of Rhune that will go out to the beta readers (and yes beta readers, she is still behind but getting closer to getting people picked and the beta released). At this point, only myself and Robin have read the book in this state, and those who receive these limited editions will have a rare peak at the difference between the beta and the final version. Because these are beta versions, the books haven’t been copy edited, so expect a grammar issue here and there. That said, they have been gone over quite a bit already so the copies aren’t as rough as say a first draft. Goodreads users – 2 drawings will be made from an official goodreads giveaway. (If you aren’t yet a member of goodreads, you can sign up for free.) I have no idea how many entries there will be, but if past giveaways are any indication, it will probably be 1 in 800. After just one day there are 700 people entered so that estimate may be low. Here is the link to enter. Dark Room member – 1 drawing will be made exclusively for member of The Dark Room (presently about 880 members). Click on the link in the header to enter. For those who don’t know, The Dark Room is a secret and private group where readers get access to special perks (like this one). If you aren’t a member and want to become one, send me an email (michael (dot) sullivan (dot) dc (at) gmail (dot) com – with the subject of DARK ROOM INVITE. Everyone else – 1 drawing will be made from those who sign up for the Rhune early release notifications. Currently, there are 190+ people signed up. Here is a link to add your name to the list. All drawings will be made at the same time (to make it easy for me to co-ordinate the shipping) 12:00 am EST on November 13. I should also mention all of the giveaways are open regardless of location…I’ll spring for the more expensive overseas shipping. Good luck to all, and remember you can register for as many giveaways as you qualify for, so feel free to enter more than one. 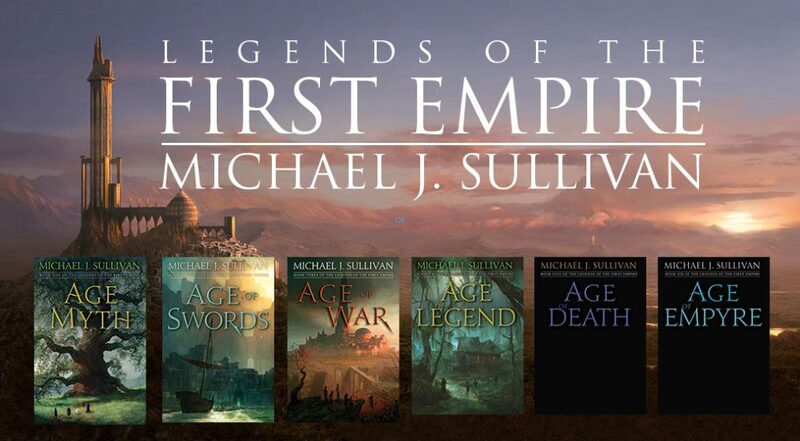 I’ve set mid-November as the date to wrap Fhrey…and hence the entire First Empire series. Fall is always my most productive writing time and now that I’m past the start of the book (I’m about 12,000 words in) things are going more smoothly and humming right along. I’m pretty confident I can hit that date. Robin, on the other hand, is a bit behind on her edits for Rhune. She hoped to be in a position to have the book in beta readers hands today, but she still has another 25% to go. So a few more days on that. The good news is her edits continue to be minor and the book is holding together nicely. It will be interesting to see what the beta readers say. One other thing…my birthday is approaching. I’ll be turning 53 in nine days and I want to do a bit of celebrating. As such I’m going to make some VERY limited edition advanced reading copies of Rhune. These are going to be essentially at the state of the beta read and there will probably only be 10 of them in the world. I thought I would give them away and I think people will get a kick out of seeing what the book started out like and what it became. I’ll be making an official post about the giveaways soon but for those that want to get in early…simply sign up for Rhune notifications at this link. If you’ve already done so..well you are entered so nothing more for you to do.